Google released Google Chrome 72 to the public on January 30, 2019. The new version of the web browser patches 58 different security vulnerabilities and introduces other changes or fixes. Most Chrome users should get the update automatically as the browser is configured by default to download and install new updates when they become available. You may run a manual check for updates in desktop versions of Google Chrome by loading chrome://settings/help in the browser's address bar. Downloads are also available on the official Chrome website; we suggest that you download Chrome offline installers to avoid Net installer issues. The official release notes highlight only the security fixes but make no mention of other changes. The update patches a critical security issue and several issues rated as high. Chrome fixes password manager logic that decides whether password manager is available. Basically, fixes this for proxy. AV1 decoder support is enabled by default. Google removed the flag that controlled it from Chrome 72. The flag chrome://flags/#omnibox-ui-one-click-unelide, if enabled, performs unelision whenever the omnibox is focused, via either keyboard, mouse, or gesture tap. Removed option to set the default polling rate using the GamepadPollingRate flag. Google set it to 250 Hz and states that the flag is no longer necessary because of that. Removed Site Per Process flag from desktop platforms because it is enabled by default and no longer needed. Now You: did you update to Chrome 72.0 already? Did you spot any major changes? 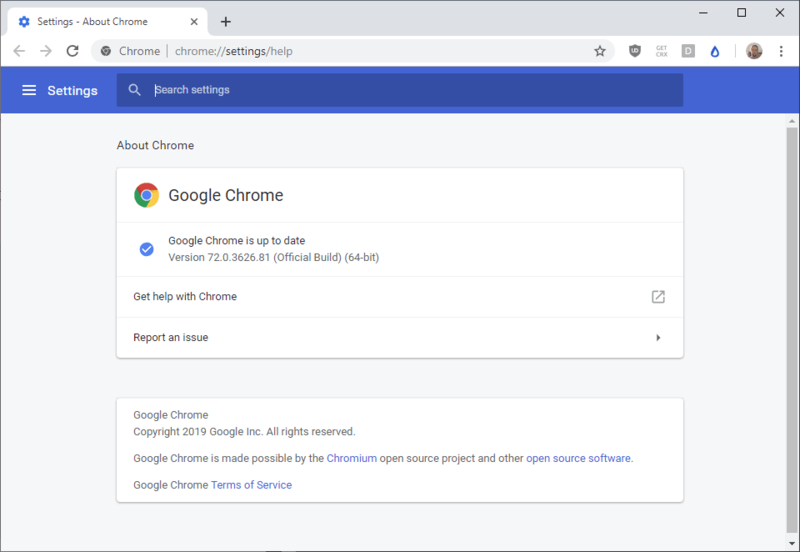 Google released Google Chrome 72 to the public on January 30, 2019. The new version of the web browser patches 58 different security vulnerabilities. Elision is leaving something out. Presumably, this means part of the URL (address) is hidden whenever the address bar (omnibox, since the Chrome address bar is also used for searches) is not focused, but unhidden (unelided) when clicking the address bar (such as to type into it). I think it means that if you type, e.g., “rock ‘n’ roll” into Google Chrome’s address bar, the setting automatically “unelides” it into “rock and roll.” So obviously, I don’t have a clue. ;-) But even after doing a little poking around on the Web, in sites both for dummies (guilty!) and for coders (not guilty! ), I *still* don’t have a clue what “unelision” is supposed to mean in this context. “we suggest that you download Chrome offline installers ” I’ve been under the impression that installing via offline installers kills the automatic update-function, is this no longer the case? That did not answer my question: if I install Chrome with an offline installer, will it update automatically or will I stay on the installed version until I look for updates manually? I am not certain, but eliding is removing letters / sounds from words. So it should logically remove parts of the URL. I found a Chrome bug that talked about the browser “eliding” the prefix from URLs. So www. or m. are removed. The general feedback on bug 88038 was that people wanted to see if they were on the desktop or mobile versions easily. So the prefix won’t be hidden when you focus on the omnibox. On my older machines, I have that disabled (i.e. Site Isolation Trial Opt-out in flags) to reduce CPU and memory overhead. If Google is going to force this performance-destroyer on users, it’s sure to slow down older systems and anger those users. Here’s your daily reminder that Chrome is Google’s most famous spyware, a company that makes the bulk of its revenue from ads and screwing people’s privacy. Don’t use it. “58 different security vulnerabilities…”. We accept them so glibly these days. since update: unable to delete history, cache, downloads…. With Chrome Version 72.0.3626.81 (Official Build) beta (64-bit) I just deleted almost 300 meg of cache OK. I see the same problem using your reference URL in incognito window as well. It happens regardless if I try to print to my laser printer or as a pdf. The reference URL prints without a problem using IE11. If you run Belarc Advisor 9.0 and display the html output in Chrome Version 72.0.3626.96 (Official Build) beta (64-bit) under Microsoft Windows [Version 10.0.17763.292], the screen output looks good. but when you try to Print either to paper or pdf, some lines are truncated no matter how you adjust in Chrome’s Settings – Font. IE11 prints the same html output file correctly. Belarc Advisor 9.0 under Chrome Version 73.0.3683.39 (Official Build) beta (64-bit) Prints to Paper or PDF if printed in landscape rather than portrait orientation. After the last update, i face many problems specially in my angular 6 application, my OidcSecurityService takes too much time to get authorized !!! With Chrome 72 and accessibility tools turned on, I’m noticing a major slowdown in page load/rendering. 2-3 seconds before v72 to 30-60 seconds with v72. Anyone else seeing this? I don’t see anything specific to accessibility tools in the release notes.